If you decide to download the Ash Ketchum Skin on your smartphone, your gameplay will change dramatically. It will become more saturated and diverse. Because there will be many ideas that can immediately be implemented. Few historical facts. The Japanese version of the series is slightly different and the hero bears the name Satoshi. But also has one cherished dream – to become the strongest and best Pokemon Master, to train on a new, more successful method of his students. This skin is good to use on maps made in the style of anime or at least, which add to the game Japanese cities, towns and other structures and education. Appearance of Ash is exactly the same as in the film – his favorite cap, jeans and a blue shirt. With this skin it’s very easy to become as energetic and open person. Ash is able to be hard as a rock, and soft in communication with friends. It’s quite easy to get mad, but if necessary he is able to collect his thoughts and act according to the situation. He will hasten to fight with anyone who opposes him. In the series Ash is distinguished by special care and warmth of attitude to his opponent – he will not be difficult to approach and inquire about the state of health of the person with whom he just fought. 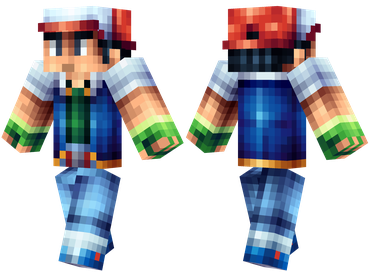 Ash Ketchum Skin will allow you to become as brave, active and goal-oriented. The main thing – do not forget to check which version of the game Minecraft PE is installed on your device.